I thought it was about time I provided a list of Indian ingredients and food terms to help you navigate the Indian Recipes on my blog. There are times when I go into great detail about an ingredient in a recipe, but other times I somehow assume you know what I’m talking about when perhaps you don’t. I am such a stream of consciousness blogger which can mean anything: short, long, TOO long, detailed, confusing, etc! Anyways, I’m sure this list is not comprehensive so if you don’t see an ingredient you are wondering about let me know. If I don’t know what it is, I’ll find out. I’ll also probably be very excited to learn of an ingredient I haven’t used before. Of if you have something to add or a comment or if I didn’t get the term/ingredient quite right, let me know! Achar Pickle, such as lime or mango pickle. The pickled ingredient is marinated and spiced with pickling spices called panch phoron. Achari Such as achari paneer. Curry made with pickling spices and usually a little amchur powder (dried mango powder). Atta Fine ground whole wheat flour. Besan Flour Fine ground garbanzo bean (chick pea) flour. Used in pakoras (vegetables battered and fried), to thicken khadi (yogurt curry), etc. Bhatura Big leavened fried bread most often served with channa masala (chick pea/garbanzo bean curry); the dish is called channa bhatura. The bhatura puffs up when cooking. Biryani Rice dish where the rice is half cooked then layered with spices and vegetables and then cooked again until finished. Generally eaten by hand and often served with a side gravy such as mirchi salan (jalapeno curry) and raita (yogurt condiment). Some recipes are very spicy! Some include dried fruits and nuts. 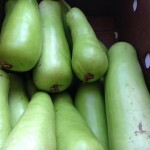 Bottle Gourd Long light green squash. More like a summer squash like zucchini but a little heavier like a winter squash. Tender and yummy in by itself or with dal. Cashews Ground into a paste and add to North Indian dishes such as shahi paneer (a close cousin to paneer makhani/butter paneer). Chat/Chaat Indian street food/snacks. Amazing dishes such as papri chat: puris (little fried crackers) topped with chick peas and potatoes, covered in yogurt, drizzled in chutneys, and sprinkled with spices. 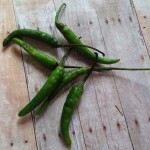 Chilis (Green) Used all the time to add spice and flavor. Cilantro Coriander leaves. Brightens any dish. Can be used during cooking for really fresh taste, but most often is added at the end as a garnish. 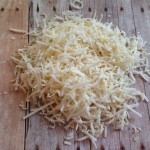 Coconut Fresh, frozen shredded, desiccated. I use mostly the last two because it is so hard to shave the meat off the coconut (even with this fun coconut scraper tool !). Curry An English term for flavorful Indian and Asian dishes. They can be a dish with gravy (“wet”) or a dish without gravy (“dry”). Curry powder isn’t used in India, rather individual spices or various mixtures of spices (called masalas) are used. That doesn’t mean that curry powder can’t be good in a lot of dishes, but the typical curry powder you can buy just doesn’t taste right in authentic Indian cooking. There is something called a curry leave, but it isn’t generally an ingredient in curry powder. Dal Both an ingredient and a dish. As an ingredient, dal refers to lentils, beans or peas that are split. As a dish dal can refer to a curry using split or whole lentils, beans or peas. See specific types of dal in Dals & Pulses. 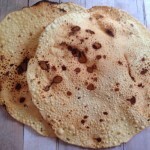 Dosa South Indian crep made from a batter of fermented ground rice and urad dal (see Dals & Pulses). Typically eaten for breakfast with sambar and coconut other other chutneys. Eno Fruit salt. It comes in a little jar and you can add it to idli batter to make them really fluffy. Ginger (Adrak) Spicy, bitey, bright. Ghee Clarified butter. Doesn’t burn like regular butter. Gram Flour See Besan Flour. 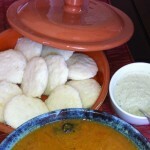 Idli South Indian steamed bread made from a batter of fermented ground rice and urad dal. Or you can use a box! Made by pouring batter into an idli pan and steamed. Typically eaten for breakfast with sambar and coconut other other chutneys. 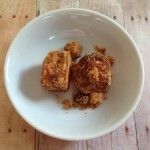 Jaggery Unrefined sugar. Used a lot in Gujarati cooking which tends to be sweet. It has a caramely taste. Not to be confused with palm/coconut sugar which is different. 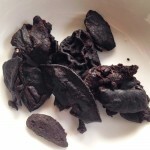 Kokum A souring agent used in Gujarati, Marathi and South Indian cooking. It is a fruit that has been dried. Put a few little pieces in a little bowl of water, microwave and add the water to the dish. Methi Leaves The fresh version of methi leaves that come from the same plant as fenugreek seeds. Bitter when tasted raw, but super fragrant when cooked in a dish. Great in dal with methi leaves and methi peas. I’ve listed kasoori methi in spices since is the dried version. 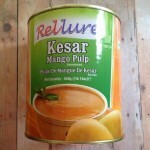 Mango Pulp Can find in a can and makes really easy mango lassi! Masala I love the word masala. It is the term for a mixture of spices, for example garam masala or chaat masala. It can also be used to describe a dish, like rajma masala (kidney bean curry). 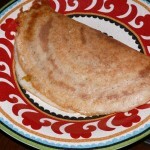 Or it can refer to dosa that has a potato filling, masala dosa. Or even a masala omlette might just be an egg omlet with onions, tomatoes and a little spice. Kind of like an enhanced more flavorful version of something! Mint Good ole mint. Great in mint and cilantro chutneys. Used in pani puri and Hyderbadi biryani and various other dishes. Mint Chutney Chutney made with mint and green chilis! Mustard Oil Used in Bengali cooking a lot. Astringent, “mustardy”, and tangy. Adds a whole new dimension to a dish. Naan Thick North Indian bread cooked in a tandoor. Pulao Rice that is cooked with spices and vegetables. Pakoras Vegetables such as onions battered and deep fried. Here are onion pakoras. Paneer Indian cheese that is very mild and great in dishes like paneer makhani (paneer in a buttery tomato gravy) and saag or palak paneer (creamed spinach and paneer). My husband makes great paneer tikka, paneer marinated in spices and bbq’d so that the outside is slightly crunchy and the inside soft. Papad Crispy wafers served as a side to a meal. They come in packets and almost seem like plastic discs. Soon before you need them, toast them on an open flame flipping back and forth until they lighten in color. Paratha Layered bread. 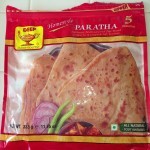 Usually made with whole wheat flour in North India. Other versions from South India, Malaysia and Africa use white flour. Peanuts Used in Marathi/Maharashtrian cooking (Maharashtra is a state in India). Podi Powder chutney often mixed with oil and served with idlis or spread inside a dosa. Here are two versions of podi. Pulse Legumes. Includes lentils, beans and peas. Puri Fried bread. 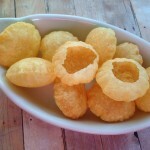 Term is used for both soft fried breads for scooping curries or little fried crunchy discs or hollow balls for chaat. Rice – Basmati Rice used in biryani. In the US this is the rice we use most often. Rice – Idli Rice Parboiled rice used to make idli and dosa batter. Rice – Sona Masuri Every day rice. Fluffy. Roti Whole wheat Indian bread. Can be thick or thin. Is a more general term for Indian bread like chapati and roti. 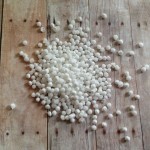 Sabudana Pearl tapioca. Sabudano khichdi is a popular breakfast dish with sabudano, potatoes, peanuts and spices. Sesame Seeds We only use this once in a while in Indian cooking. Marathi dishes and and various other recipes, like sesame seed podi. Sev Little crunchy fried noodles made from besan (chick pea) flour. Sev comes in various sizes and can be bought at an Indian market. Strangely enough it makes a great sev curry! 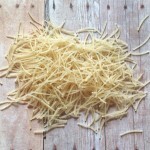 Seviya Thin short rice noodles. Used in a popular breakfast dish seviya upma. Sooji Semolina or cream of wheat. Used in the breakfast dish upma where the sooji is browned in a little butter and then cooked with onions and spices. Sweet Chutney Chutney made with tamarind and dates. Great on chat! Raita Yogurt mixed with fun stuff, such as cucumber, onion, carrots, or even chilis or toasted cumin seeds. 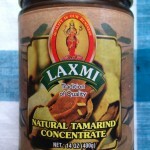 Tamarind Tangy souring agent. Is sold in blocks or as a paste. If you get the block, you need to soak a piece and take out the fibrous parts before adding to a dish. The paste is awesome and easy-be sure to get the “natural” paste in a jar. There is also a plastic container of tamarind concentrate that is super sticky and tart and very different (good in its own way, but different). Tadka or Tarka or Temper Frying whole spices and sometimes other ingredients like garlic or green chilis and adding it to a dish. This can be done at the beginning of cooking before adding other ingredients or it can be done in a separate little pan and added at the end. At the end it give lots of aroma to a dish, especially dal. Thali An Indian meal of a lot of little dishes. For example, you can go to a South Indian restaurant and order the thali and you’ll get a couple of veggies, sambar, rasam, rice, etc. It is great if you’re not with a big group and want to try everything. Tindora Unique Indian vegetable also called ivy gourd. Little gourds about the size of your thumb. Great sliced lengthwise and sauted with spices. Yogurt Goes well with all Indian meals!